1SI-20P-NAV5 for $21.40: .375" x 1.125" imprint. Our 2000-Plus line. This is the one I use - it only takes up about 2 lines on the small logs. 1SI-20PGL-NAV5 for $24.50: .375" x 1.125" imprint. 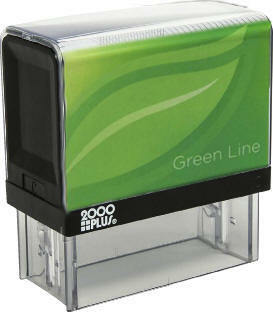 This is our 2000-Plus Green Line: stamps contain at least 70% recycled plastic. 1XP-N40-NAV5 for $29: .375" x 1.125" imprint. 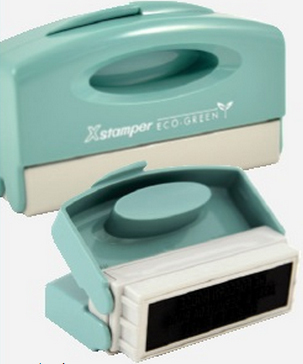 The X-Stamper Eco-Green stamp. Over 50% recycled content by weight, Compact size. 1XP-N40PK-NAV5 for $30.10: .375" x 1.125" imprint. The X-Stamper Eco-Green stamp. Same as above, but with a pink housing. 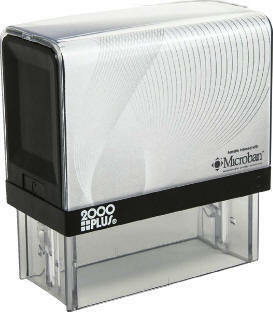 We do have other sizes and shapes available if you are looking for different kinds of stamps. Just email me! cheryl @ liongraphics.com (no spaces). If no color is indicated, Black will be used. Pink ink is also available: X-Stampers only. Email us with your order: cheryl @ liongraphics.com (remove spaces). If you have your art on disk, email it to us. We work in Freehand MX and Illustrator CS3, and can open most electronic files. I will send you a digital proof and itemized invoice with payment instructions. Don't forget to let me know your name and your shipping/billing address(es).